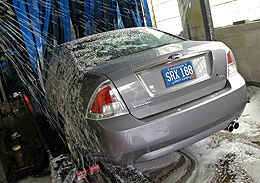 2006 Ford Fusion Chosen International Car Wash Association's "Most Washable Car"
Dearborn, MI - March 9, 2006: Americans definitely "feel the love" for their cars and trucks, but they're not showing it when it comes to keeping up with their babies' hygienic needs, according to a survey by the International Carwash Association. At first blush, the ICA should be cleaning up, based on its findings: 87 percent of Americans admit to having an emotional bond with their cars, and 62 percent believe car appearance is essential. What's more, 60 percent bare their souls to their cars behind the wheel, and 27 percent give them pet names. But the ICA survey also indicated more than half the respondents, 52 percent, wash their cars less than once a month. Worse, 15 percent never wash them, and an estimated 37 million cars even smell — not that fragrant, new-car aroma, but rather the odor of garbage, such as ketchup-smothered, fast-food fries that slip between the seats. Overall, that translates to 73 million car slobs out there, according to the ICA. But regular car washing has a more pragmatic side, too. A clean car is not only a happy car, but good auto hygiene also helps improve residual values. "It also contributes to [a car’s] long-term condition and value," says Mark Thorsby, ICA executive director, who points out that $24 billion a year is spent battling corrosion. He cites auto trade-in professionals such as Kelley Blue Book that indicate cars in excellent mechanical condition and appearance can be valued as much as $1,500 higher than those in good or fair condition. The biggest car-finish culprits include the corrosive mixture of sand and salt on wintry roads, pollutants from rainfall, bird droppings, road grime and tree sap. So how often should you wash your car? Depends on where you live. The ICA publishes a state-by-state guide on its Web site, www.carlove.org. For instance, if you live in an Eastern seaboard state that has the usual corrosive culprits plus marine-salt air, you should wash once a week. If you live in bone-dry Arizona, once or twice a month is the recommendation. And what is the easiest car to keep clean? 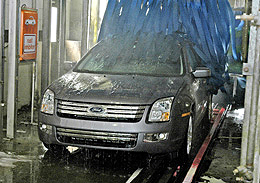 The 2006 Ford Fusion, the ICA’s "Most Washable Car" of 2006, cited by Thorsby for its moldings, bumpers, mirrors and wipers that are securely attached, its smooth lines, and its lack of dirt-trapping indentations and crevices. "We salute Ford for its design of a truly exemplary vehicle," he said.